Yes! I am not talking about PR1.1, its something new that appeared on my Nokia N8 by today only. 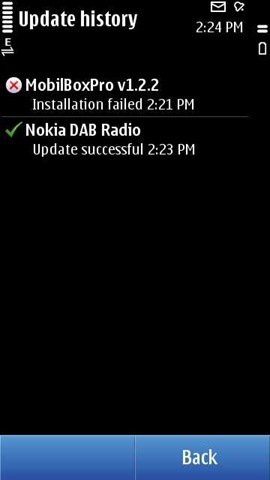 We know a little about DAB update as it first appeared with video subtitle support update back in Janaury 2011, but that time it was not available for Indian Nokia N8 units like mine. But this time looks like it got released worldwide finally. 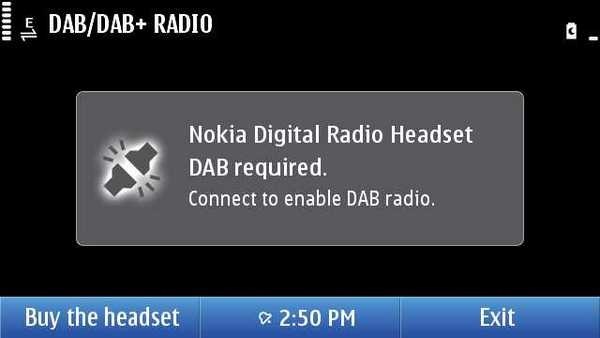 Though before you get very excited about these optional updates, let me tell you like as you can see in above pics, DAB update requires a particular headset to get along with that and when you even head to product page then you come to know that this product is available in UK only. One should seriously ask Nokia that if this is the very particular regionally targeted delivery system, they keep talking about. 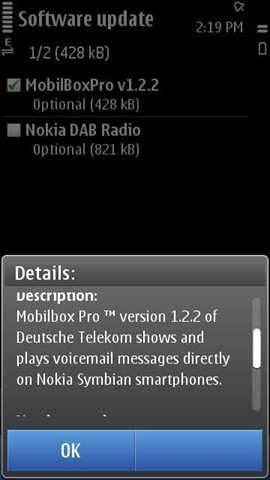 As about the other update that is MobilBox Pro 1.2.2, then though it failed to install on my Nokia N8 and same with many of other users at least, but thanks to @HardikLive we know that it worked for many of users too. I doubt that its again the case related to Qt version, as me and many users already have Qt 4.7.1 rather than the official version provided by Nokia Firmware PR1.1. The service is called Mobilbox Pro and enables T-Mobile customers to access their voicemails directly on their phones. Using Communologys Visual Voicemail clients, the user can decide which voicemail he wants to listen to first. With one click, the user can delete, store, or forward voice messages. Incoming voicemails are seamlessly matched with the users phone book displaying the relevant picture. The portfolio of supported phones started with Symbian devices with more platforms to follow. Visual Voicemail clients will also soon be embedded in mobile devices. T-Mobile customers will then be able to use the popular VVM service Mobilbox Pro without downloading or installing any software. 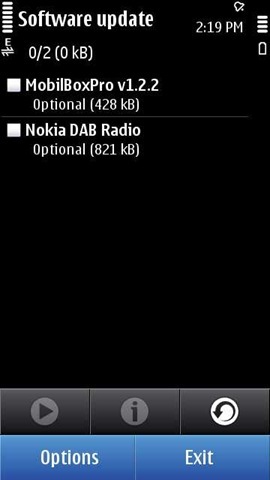 You can see the icons of both the apps in the above screenshots, but you already seen in first screenshot that DAB Radio app is kind of useless without headset and strangely none of users have got this MobilBox Pro working over their Nokia N8. I understand that Nokia has a biggest in world mobile user base and its not an easy to keep the regional availability of updates very accurate, but one sure expect the same. Please report to us, if anyone of you found MobilBox Pro working for them. Hey… i can’t see the updates… was it something like 1 day affair??? mobilbox was preventing my n8 from receiving text messages so i had to uninstall it. how did you manage to uninstall mobilbox pro? Yesterday i updated my nokia n8 sotware and i realized this app called mobilbox pro and when i press on its icon ,it never lunch. What shell i do?i think i will remove it better . And other one more problem with me is that nokia will stop ovi contacr and releaze a new soft i downloaded on my n8 and when i tried to lunch it , it says sorry not working in your erea. Whats either the socially app not working for the same reason.i wish from nokia to deal with all its customer arrond the world (same dealing)equally and let all people who own nokia mobiles use applications . Socially should work though MobilBox is related to T-Mobile.voicemail services only so no use for rest of the world.